Very excited tonight about the sheep shearer coming in the morning. I'm delighted that so many of our JRF friends are able to join us on a weekday morning, with little notice. Battle stations are arranged and we should operate like a well-oiled machine. Answered prayer: rain fell all over the metroplex today, but avoided the farm, so we still have dry sheep. They have mud up to their ankles, but still, the fleece is relatively dry, and that's what counts. while fondling the soft Jacob fiber. 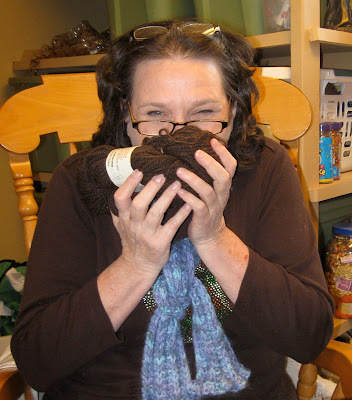 Another incredible blessing, Mary was able to come over today for several hours and help me get the Jacob rovings and yarns prepared for sale at the Wildflower Fiber Retreat this weekend. It was a last-minute windfall that I HAD to have ready to offer the ladies at the retreat. This is a very cool fiber get-together that's been held for over 20 years at a wonderful campground in the piney woods near Tyler, TX. We enjoy workshops, vendors, great fiber companionship and great food. Looks like the yarn passes the 'yummy' test. There are great natural colors and dyed yarns in this collection. I have a few bumps of luscious Jacob roving in some natural colors. I'm pretty sure these will go fast. I really wanted to be there today for the shearing!! But, reality is that I must have a J.O.B.! So, it should be a wonderful day too for you guys! 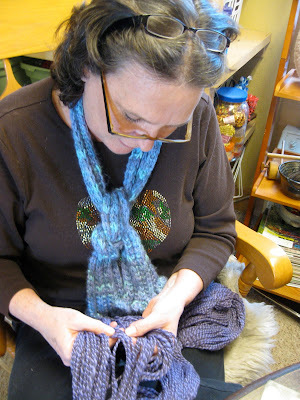 That yarn and roving looks great! I agree, it should sell well!